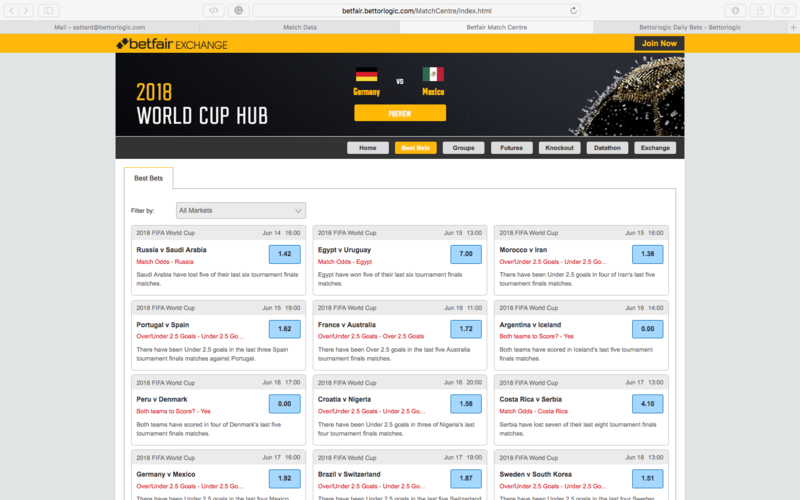 Thursday 28th June 2018 – Bettorlogic, the leading betting analytics software company, has extended its partnership agreement with Betfair Australia to build a bespoke World Cup Match Centre for Russia 2018. The standalone World Cup Match Centre launched in time for the tournament which is almost a fortnight in and is already seeing excellent engagement data. Bettorlogic’s match centre also caters for all the betting needs around the biggest sporting events of the calendar year. Bettorlogic is providing previews for all 64 matches plus long-term previews for the outright, golden boot and group markets. The innovative widget will be a one-stop shop for stats, editorial, pre-match and in-running bet prompts for the tournament. Examples include Bettorlogic predicting Switzerland would qualify from Group E ahead of Serbia following a successful qualifying campaign where they amassed 27 points from 10 games level with Portugal. On top of the World Cup content, Bettorlogic are to provide editorial previews for all Champions League matches and all Premier League fixtures, alongside daily coverage of the remaining Grand Slam Tennis tournaments in 2018 at Wimbledon begins next week.